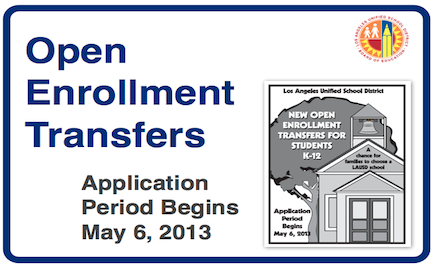 Every year LAUSD offers up a list of schools that have seats available to anyone who would like to apply for them through a process called Open Enrollment (OE). This is an easy way to transfer to another school without having to jump through all the hoops one typically does with the permitting process. Every year the District determines which schools will have open seats and how many for the following fall, then posts the list in May on their website. Schools are listed under their Educational Service Center: North, South, East, or West. During the application window, which opened this year on Mon, May 6th and closes on Fri, May 24th, you may go to as many of the OE schools listed and apply for a seat. Applications are available at each school site, and are a brief one-page transfer request. At the end of the application period, if there are more seats than applicants, everyone who applied will be offered enrollment. If there are more applicants than seats, the school site will hold its own lottery to determine who gets offered enrollment and the sequence of their waitlist. You may apply to as many OE schools as you like. Once enrolled on an OE transfer, you do not need to reapply each year. This entry was posted in LAUSD News, Public School and tagged admissions, last minute option, LAUSD, OE, Open Enrollment, openings, Public School Choice, school enrollment, school options by gomama. Bookmark the permalink.